During the fall of 2005, several families began meeting each Saturday morning to pray for the Lord’s leading in the hopes that He would bless the efforts to start Clapham School. Today, over a decade later, prayer is still a vital part of Clapham School. 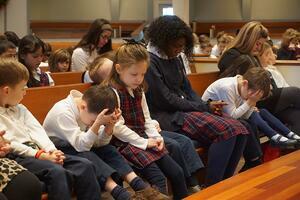 Each school day is started with prayer by faculty, administration, in student assembly, and in classrooms. We invite you to join us in prayer at formal events that are designed to offer the chance at corporate prayer. Moms’ Prayer: A monthly gathering of mothers of students in the school. Dads’ Prayer: A monthly gathering of fathers of students in the school. Dads’ Prayer meets before school. Visiting a class to pray: We welcome grandparents, parents and visitors to come in and sit in the back of a class to observe anytime. Often this time is used to pray for the students and teachers of that particular class. The Clapham students and families. The students are asked to take their studies and character development seriously. But our greatest concern is that their parents, teachers and others in influence over them are shepherding their hearts and pointing them to Christ. Pray for them. The Clapham faculty and staff. Pray that the teachers would have a vibrant faith in Christ that grows each day. We long for the infectious love of Christ that they have to be the most important way that students “catch” a glimpse of what a life transformed by the gospel looks like. They have a significant opportunity to shepherd the young students in their care. Pray the Lord would use them for His glory. The Clapham board. The board meets monthly to discuss the needs of the school. They begin each session with prayer, have a devotional, and end the meeting with prayer. Please pray that the Lord would guide them and other school leadership as they seek to build a learning community that honors Him. Our host church and our community. We are thankful to be meeting at College Church in Wheaton. Please pray we would make the most of the opportunities we have to serve those in need around us. Our Vision is to encourage a life of service to Christ in the students and ourselves. Please pray we would be faithful to that Vision.